In the late 15th century, the European kings sent their boldest explorers in search of new routes to treasure-filled India. Many returned home on ships laden with silks and spices. But they missed the real treasure of India just then being profusely distributed by the great avatar Sri Krishna Chaitanya. 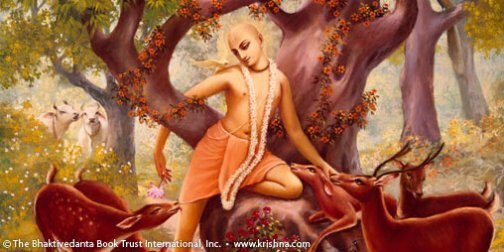 Lord Chaitanya pioneered a great social and spiritual movement that continues to spread its profound influence worldwide. He transformed India in four respects: philosophically, by defeating the greatest philosophers of his day; socially, by opposing the rigid caste system; politically, by organizing India's first civil disobedience movement against repressive government; and, most important, spiritually, by teaching and demonstrating the science of love of God, bhakti-yoga.